Which Presidential Personality Are You Like? 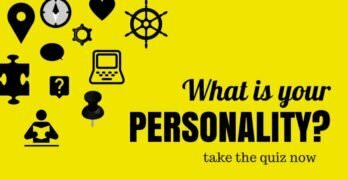 Have you ever taken a personality quiz to find out the whats and whys about yourself? Well, the Myers-Briggs Type Indicator (MBTI) is one of the most widely used. It is even used by Fortune 500 companies when hiring CEOs, but the MBTI can be applied to anyone—living or dead. 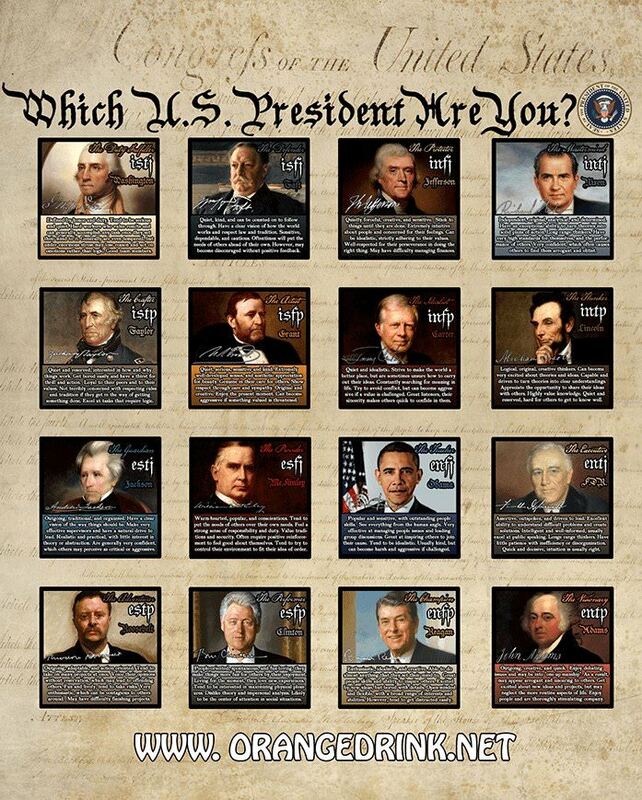 If you have ever wondered which presidential personality you are like, look no further. To make things easier, the Myers-Briggs breaks people’s personalities down into four different pairs of qualities. Specifically, these pairs are extroversion and introversion, sensing or intuition, thinking or feeling, and perceiving or judging. 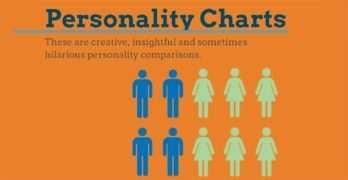 With these four pairs the Myers-Briggs has formulated 16 different personality profiles to broadly fit the numerous personality types. This is not a rigid system and some people may be a little bit of both pairs in a given category, but chances are, you recognize yourself somewhere in here. Let us start with the first pair which refers to attitude. Extroverts love a good mixer. These people feel right at home in the middle of a crowd and love to be the center of attention. Able to schmooze and hob nob with the best of them, extroverts are often the life of the party and make everyone’s experience more interesting. This group feeds on the energy they get when interacting with others and often abhors long stretches of quiet, alone-time. Extroversion is easily identifiable in Bill Clinton. On the other side of the coin, introverts are exceedingly private people, sometimes painfully so. All the action and attention of a big crowd will often leave introverts feeling drained, both emotionally and energetically. When this happens, introverts are wont to find a quiet book and nice quiet corner to recharge. Moreover, introverts are comfortable spending a lot of time without talking to many people and are regularly known for keeping a small, close group of friends. It may seem counter-intuitive for a politician, but Abraham Lincoln is a good candidate for introvert. Sensors prefer to rely on what their eyes and ears tell them and have little patience for people who like to trust generalized feelings. The consummate empiricist, sensors favor perceptions that they can verify themselves and distrust the idea of a larger structure that they cannot point to as the cause. Relying on facts and evidence, people who have a tendency to believe they are right without proof seem to have no basis in reality for sensors. A president who prefers sensing perception as opposed to intuition would be Theodore Roosevelt. Opposite sensors, intuitives may examine what they can see or hear, but they are just as likely to toss all of that out the window and simply go with their gut feelings. Believing that sensors miss a great deal of subtle or implicit information, intuitives trust their feelings in a situation that may not have an immediate answer. People who favor intuition are also likely to look for an over-arching cause or dynamic that influences the circumstances of the situation and might be vitally important—or disastrous if ignored. Thomas Jefferson is a president who trusted his intuition. Feeling-based people understand that facts are important, but how other people feel is important too. These people make decisions keeping in mind how other people might feel about it—and how those feelings might cause people to react. They may not also use a level-headed approach, but they have a big heart. Feelers understand that people are often irrational and, to make good decision, that must be accounted for. A great example of a presidential feeler is Jimmy Carter. Thinkers, on the other hand, prefer to make their decisions with strict logic. The feelings of other people are not worthless to thinkers, but those feelings are not nearly as important as the facts of the matter. Thinkers can come off as cold or uncaring people, but they place a high priority on making rational decisions. These people have a strong desire for objective truth and use deductive, rather than inductive, reasoning to inform their decisions. When looking for a thinking president, look no further than Richard Nixon. Perceivers have a tendency to appreciate disorganized complexity. There is no mess too tangled for a perceiver to untangle. These people dislike rigid structure and are likely to jump from one topic to the next. Perceivers may be adept at managing a chaotic situation exceedingly well, but they also have a tendency to be a little chaotic in their own life as well. Ronald Reagan preferred perceiving as a president. Lastly, judgers, despite their name, are the opposite of perceivers and not just judgmental people. Judgers prefer order to make understanding a situation and coming to a decision easier. These people cannot handle chaos and will attempt to instill order where there is none. Sometimes judgers may seem a bit persnickety to others people. A presidential judger would be seen in Franklin Roosevelt. Which Dragonball Z Character is Your Personality?